My final academic year at university has included a module on the history of the body in early modern England. The module was wide-ranging, examining a host of challenging and interesting themes that included death, fashion, pregnancy, anatomy, illness and sexual regulation. Only in the final week of the module did we consider what early modern Europeans termed 'unnatural' or 'foreign' bodies. Given that this was an age when great voyages of discovery were being made across the world, it is unsurprising that we looked at sources concerning the experiences of Europeans with 'natives' dwelling in Africa and Asia. In the seminar, twenty minutes was devoted to discussion of black people in early modern England, in a module lasting one academic year in duration. This presents a troubling question: why does Tudor history continue to be whitewashed? (Forgive the pun). Black people clearly lived in England and were a vital cultural, social and economic presence. Only when their history is taken account of and included in both academic studies and in curriculums can the experiences of those living in the past fully be understood. Our understanding of Tudor history remains overwhelmingly confined to the experiences of those who were wealthy, privileged, and white. 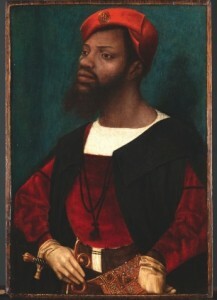 If you are interested in reading more, I wrote an article for The Tudor Society about Africans in Tudor and Stuart England: https://www.tudorsociety.com/africans-in-tudor-and-stuart-england-by-conor-byrne/.